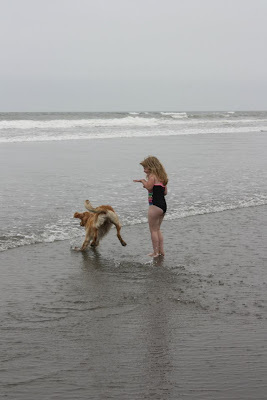 Preschoolers and puppies...ever thought of the similarities between the two? Both need to be taught how to control their bodily functions :), learn basic manners (no biting! ), and how to come when called. It's that last point that I want to talk about today. Did you ever think how important it is for your child to come when called? If a mom calls for her child, she probably has a good reason. It could be that she can't find him. She could perceive some kind of danger. She might need him for something. Whatever the reason, she doesn't need to go through the panic of searching for her hiding child, or chasing him as he runs away from her. She needs him to obey her...now. Back to the puppy analogy. If a puppy doesn't come when called, he could end up getting hit by a car. He could lose his freedom. He could lose his owner's trust. The frustrated owner ends up taking him to obedience school in the hopes of rehabilitating him. Frustrated Mommy's also have to work with their little children to train them. What you want to be able to do is call your child's name and have them respond by saying, "Coming" not saying, "What?" or worse yet, respond by being silent. You don't want to have to yell across a room or parking lot as you explain what you want from your child. You want them to come to you. In the case of danger, there might not be time for explanation. Try working with your little ones and teach them how to respond when you call them. Tell them that it's important to come when they're called. It's not time to tease Mommy. Be patient but expect them to obey. They'll learn. You'll save yourself many a panic attack.